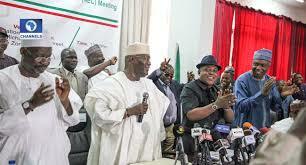 The Peoples Democratic Party (PDP) is holding its 84th National Executive Council(NEC) meeting in Abuja. In attendance are the Presidential Candidate of the party, Atiku Abubakar, National Chairman Uche Secondus, and other party leaders. The meeting comes a day after the ruling All Progressives Congress (APC) caucus met in Abuja, where the party condemned the postponement of the general elections by the Independent National Electoral Commission (INEC) and accused the electoral umpire of colluding with the opposition PDP. Hours to the commencement of the elections on Saturday, February 16, INEC postponed the Presidential and National Assembly polls to February 23 and the Governorship and Houses of Assembly Elections to March 9, 2019. The PDP had expressed outrage over the postponement of the elections and accused the ruling APC of an attempt to rig the polls by allegedly asking INEC to stagger the polls. But INEC Chairman, Prof. Mahmood Yakubu, had ruled out any form of political influence in reaching the decision, saying it was based on the logistical challenges that cropped up in the run-up to the polls.